Back in stock after nearly a year of not being available! 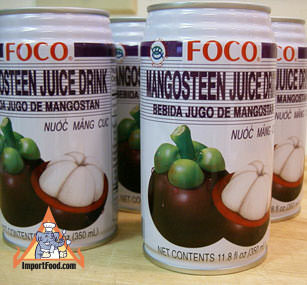 Mangosteen has a heavenly aroma and taste, and here we have a mangosteen drink made from pure mangosteen fruit. The color is a slight pinkish, and we like to drink it plain or mix it with soda water, 7-Up, or even vodka to make a delicious cocktail. This juice is a new product, packed by Thai Agri Foods (Foco brand) which is one of the largest food companies in Thailand, a massive corporation with the most modern standard of packaging equipment. Comes in a nice durable can that seems a lot thicker than what a locally-produced beverages are packed in. Ingredients: water, mangosteen juice (30%), sugar, citric acid. Product of Thailand.